Welcome to Ciclismo Classico’s 30th year of offering the world’s finest bicycle vacations. It seems like yesterday that I was a happy-go-lucky anthropology student at Cornell riding around the Finger Lakes and teaching bicycle instruction to wide-eyed freshman. After graduation, it seemed natural that I would expand my pedaling horizons to Europe, seek out my Italian roots in Le Marche. 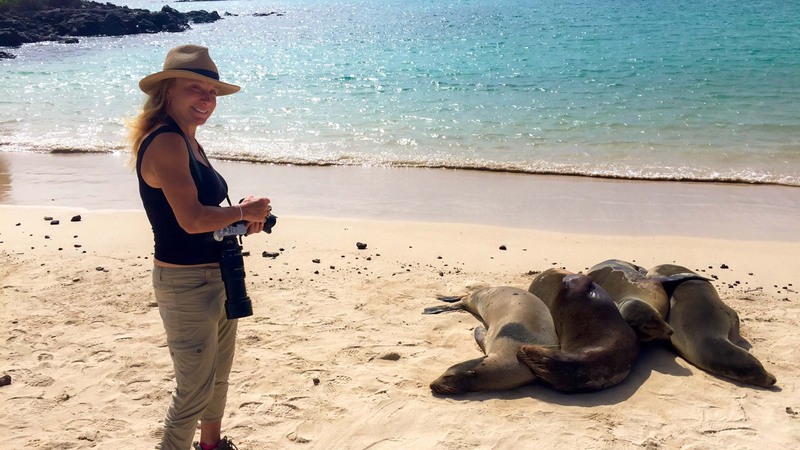 My motivation was simple and has remained true: to serendipitously follow my curiosity and connect with gorgeous landscapes new cultures, history and my family’s roots. Three months, five countries and two thousand miles later I spun back to Italy where I I fell in love with a landscape, culture and its dreamy roads and passionate pedalers. After a few rides in Tuscany, I knew that my life would revolve around bicycling and Italy forever. I joined Mario Conti’s Florentine Bike Club Il Chi C’e C’e (Whoever is Here, is Here) and over the next three years explored all over the boot by bike. Fueled as a dream of sharing my passion for Italy, cycling, travel and cross-cultural exchange (putting my degree to use! 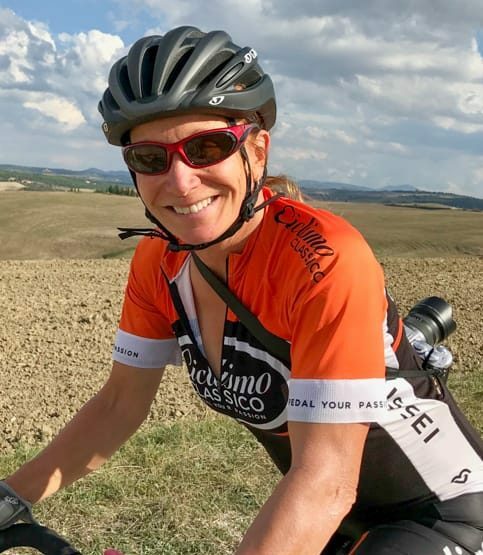 ), I founded Ciclismo Classico as the first woman-owned company to specialize in Italian bicycle tours. Our mission: to inspired people to embrace cycling as a soulful form of travel that connects each one of us to the world and perhaps the most exciting and important place of all: the passionate, the curious and creative human spirit. After 30 years, my passion for cycling and discovery grows stronger. Over the years I have been blessed to share this Ciclismo stage with so many amazing actors and backstage brilliance. An affectionate toast, a “cin cin, goes out to all our wonderful guides, USA & Italy team, guests, family and Ciclismo supporters in the USA, Italy and beyond. Grazie a tutti. We are all continually excited by the poetry and power of the bicycle as a metaphor of what the world needs more of now: simple, sustainable and joyful ways for humans to connect with the world around them. Riding a bicycle any distance is one simple and small way we can all make the planet a better place. Ciclismo Classico, the pioneers in bicycle travel since 1989, creating an active experience that sparks your passion is our sole mission. 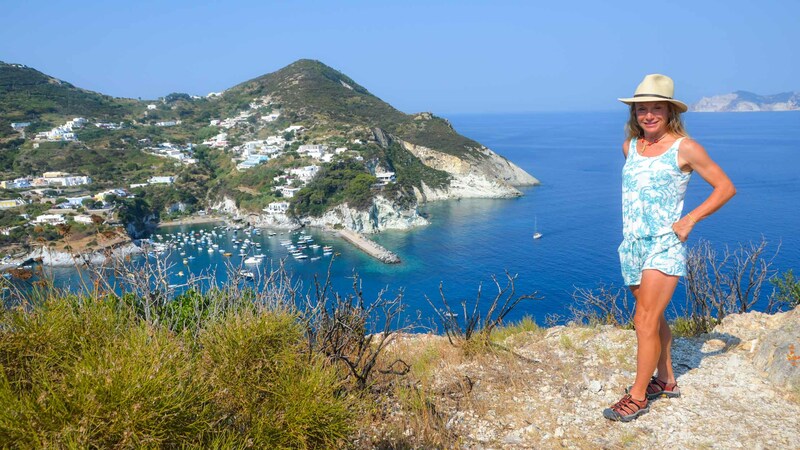 Like chefs who intuitively know, love and seek out delicious flavors to blend into a succulent dish, our Ciclismo Classico itinerary-dream-team combines an insatiable love of cycling, travel, and culture with a rich imagination for creating one-of-a-kind, two-wheeled and photography tours. This special blend of ingredients, the “Magical Ciclismo Menu,” has earned dozens of awards and thousands of accolades and is a feast for the senses that will win a place in your heart. That is my personal guarantee. Are you ready to soar through a landscape with eyes wide open and pedal to your heart’s content? Do you long to follow your cultural curiosity through ancient villages or listen to the sweet sounds of life play a soulful tune? Is it time to simply unleash and completely satisfy your taste buds? Can’t resist stopping and taking hundreds of photos? Why wait to enjoy these sensory adventures with family and friends? You deserve to live life to its fullest, sleep like a baby and awaken excited do it all over again! After inspiring thousands of guests and designing the world’s most innovative cycling itineraries, one simple principle remains at our Ciclismo Core: life should be active, fun, delicious, educational, flowing, strengthening, energizing and deeply connected with beautiful places and their people. Whether you are pedaling a bicycle or looking through a lens, you will discover, on a Ciclismo Classico tour, that life itself is a dream waiting to happen. Come discover and ignite your passion with us in 2019. You may never be the same again. What are you waiting for?